Whether we are talking about people living in a megalopolis like São Paulo or those living in the middle of the Amazon, we know they spend increasing time on smartphones and tablets. Arguably, younger generations do not even seem able to function without their smartphones. While most of the time spent on these gadgets can be wasted, not all is lost. We pay bills, check the weather, call taxis, learn a new language, control our diet, monitor exercise, and now we can also monitor natural resources! Two apps launched recently in Brazil intend to help monitor fishing resources: “Fisheries Monitoring Software” (in Portuguese, Software de Monitoramento Pesqueiro, by iSUS) and “Fish+” (Portuguese, Pesca+, by WWF Brazil). The two apps target different audiences. The Fisheries Monitoring Software intends to be used by collectors of fishing data, such as governmental institutions in charge of fishing statistics. Fish+ was developed to be used by fishers, especially those living in remote areas or those neglected by official monitoring. The Fisheries Monitoring Software offers multiple interfaces where one can enter data about fishers, catch, fisheries technology (boats and gears), biometry of different species, and the advantage of generating quick, simple reports useful for management. The idea is that the software will save time and money by avoiding the use of extra personnel to enter all the data into a computer later. Moreover, such extra work often results in partial databases lacking the complete set of collected information. With the cellphone app, the data can be easily downloaded to a computer everyday or whenever necessary. 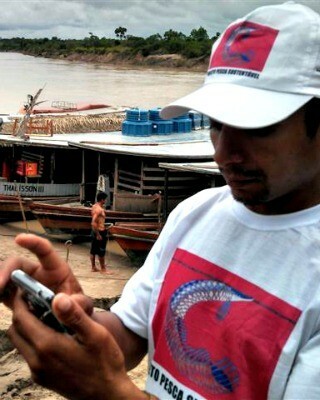 Fish+ is a tool for people living in isolated communities, meaning that the app works offline. Fishermen can register their activity (crew size, boat type, gear, size and length of the catch, etc.) and whenever they have access to the internet, previously logged data is uploaded to a common database. In the Amazonian region where it is currently being tested, the data are uploaded when fishermen go to the closest urban center, which happens every 30-40 days. The use of the app can potentially increase the involvement people have with conservation and make them aware of their own activities, through this type of participatory monitoring. These are good news for fisheries: we can use technology to know how we are affecting fish populations. Now please, use your smartphone, tablet or laptop and spread the word by sharing this post on Facebook or Twitter! Width: Wider kayaks give greater soundness and support. However there are different elements too that may influence the solidness of the Kayak. This is a brilliant blog! I'm very happy with your job!. Learn about the fishing industry with the help of the allcoast sport fishing portal. Online fishing knowledge databases are fast becoming the need of the day with many people searching the online stores for the best deals in fishing equipment and tour plans My blog .